In a medium mixing bowl mix the grated onion, a handful each of the chopped parsley and mint, the allspice and one of the crushed garlic cloves. Add the lamb, lemon zest and half the cooked couscous then season with salt and pepper. Mix thoroughly (using your hands is best), then wet your hands and shape into 6 equal-size kofte (5cm sausage-shaped patties). Heat a griddle pan or frying pan until smoking. Brush the kofte all over with the oil and fry for 10 minutes, turning, until evenly browned and cooked through. Meanwhile, in a serving bowl, mix the remaining garlic with the lemon juice. Whisk in the 3 tbsp oil and 2 tbsp cold water, then season with salt and pepper. Add the remaining couscous, the cucumber and most of the remaining herbs and toss to combine. 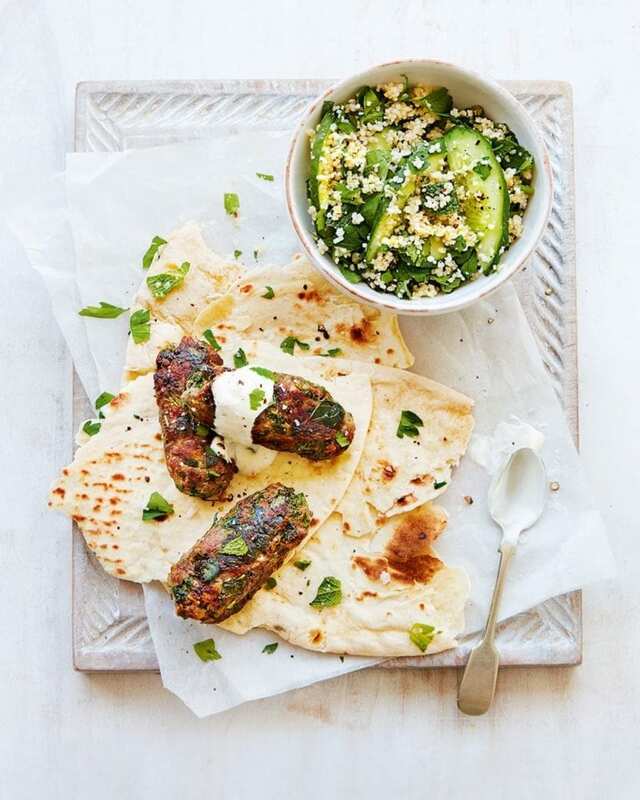 Serve with the kofte, warmed flatbreads and yogurt, sprinkled with the remaining parsley and mint. If you don’t have any leftover couscous, make this with a roasted vegetable couscous from the deli counter or pre-packed salad aisle in the supermarket.